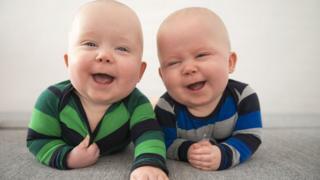 Jack is the most popular name for baby boys in Scotland for the 10th year in a row, according to new statistics. The National Records for Scotland has also revealed that Olivia is the top girl's name for the second consecutive year. Oliver is the second most popular boy's name while Emily is in second place in the girl's name chart. The latest statistics reveal that there were 25,384 boys and 23,935 girls born before 2 December 2017. The report also revealed a long-term trend in the variety of the names parents are choosing for their children. In 1900, 68% of boys were given a first forename that was in the top 10. In 2017, that figure drops to 12.5%. There were 2,050 different girl's names recorded in Scotland in 1977 - a total of 4,221 have been recorded in 2017. Culture Secretary Fiona Hyslop, said: "Naming your baby is such an important decision and it's always fun to see the names parents around Scotland are choosing. "This year's figures show some names have an enduring appeal, with Jack and Olivia confirming themselves as the most popular across Scotland - Jack for the 10th year in a row and Olivia for the second. "The trend for unique names remains far higher than it has been in previous decades, indicating that today's parents are thinking long and hard before choosing names for their babies." Both Olivia and Emily cemented themselves in the top two places in 2017. Isla climbed one place to number three, pushing Sophie into fourth place. Amelia and Ella remained in in sixth and eight places respectively, while Jessica climber two places to number five, pushing Ava to seventh. Charlotte climbed up to ninth, while Aria was the only new entrant in the top 10, climbing from 12th in 2016. The popularity of Harper has continued to grow since Victoria Beckham gave her daughter that name in 2011. It is one of two new entrants in the Scottish top 20, having risen 12 places to 18th, while Hannah is up five to 19th. While Jack has retained its place at the top of the table for a decade, in 2017 James fell to third while Oliver climbed to second place. There was little change in the rest of the top 10, with the exception of Harris, which jumped six places to seventh. Lewis, Noah, Logan, Alexander, Leo and Harry remained in the top 10, but Charlie dropped out, moving into 14th place. Alfie, Aaron, Thomas,Archie and Rory all appear in the top 20, having seen their popularity increase. Theo was the 27th most popular boy's name in 2017, after climbing 18 places. Mohammed has also grown in popularity, moving up 11 places to 36th, and Jude has climbed 12 to 37th. The NRS also found that Freddie has also seen a surge in popularity, after it surged 26 places to 46th. In the girls' chart, Poppy climbed 13 places to 30th, Sienna was up to joint 32nd - up 36 places - while Willow climbed 17 places to 45th. Mila also makes an appearance in the top 50 - at number 50, up from 70th place.